Yesterday was the shortest day of the year. It was dark for 16 ½ hours. Here in Ireland we just flicked a switch to put on the light. And got on with cooking, working, surfing, or relaxing by the Christmas tree. For 1.2 billion people around the world that’s just not possible. They have no access to electricity. 1 in every 6 people on Earth. When the sun goes down, life gets more complicated: cooking, washing, reading, homework, socializing, safety are all curtailed by a lack of power. We want to help change that in 2017. Because the future is bright. The future will Run on Sun. When the solar electricity system was turned on in Mvimwa Primary School in Tanzania in 2012, literally every light in the building came on, not to mention the fax machine and the photo copier. Because they had relied on a diesel generator that was only on for a couple of hours a day – there were no switches anywhere in the building! That meant a couple of extra hours work for the engineers from Solar Without Frontiers installing switches but by the time night fell the battery system was also fully charged. The school glowed like a beacon in the dark countryside. The students can now get much more use from the computers they got from Irish NGO Camara, the teachers can now easily print and photocopy materials, and night time use of the school is now much safer. The noisy diesel generator has fallen silent and the school is saving €4,000 a year in fuels costs. 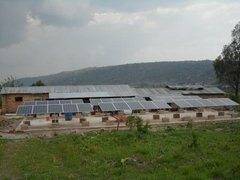 Solar Without Frontiers want to return to Mvimwa in 2017 to put a solar system in the local hospital to power lighting, refrigeration for medicines, and equipment such as x-ray and ultrasound. Between now and midnight on 31st December we’re going to give half of all the donations we get to Solar Without Frontiers' Mvimwa Appeal. So give what you can now and half of it will go straight towards the cost of putting solar panels on the roof of Mvimwa’s hospital. And while Solar Without Frontiers helps Mvimwa leap-frog the fossil fuel age into the renewable future we plan to step up our campaign for a fossil-free future for Ireland too. Today, daylight in Dublin will be 4 seconds longer than yesterday, as the Earth’s orbit begins to take us back toward the light. By summer solstice time, daylight will last for 17 hours. That’s what makes Ireland such a promising place for solar power too. Solar panels here will generate as much power as they would in Britain, which generates 5,000 times the electricity we do from solar, or Germany, where 1.5 million people generate solar electrify on their roofs. Ireland is ripe for a rooftop revolution. What’s missing is a fair payment for the solar electricity that you supply to the grid because you don’t use it yourself. Right now there’s no payment so you just have to give the electricity away, making installing the panels uneconomic for most people. We’re campaigning for a guaranteed price that would kick-start community ownership of renewable energy and give meaning to the Government’s promise of “energy citizens” being at the heart of the transition to a carbon-free future. We’ve already got over 6,000 signatures on a petition demanding a fair price for solar. With your help we can step up our campaigning in 2017 to get that to 10,000 in time for a long-planned public consultation on support schemes for renewables. A decade ago Ireland was the 6thmost generous overseas aid donor per person among rich countries. We had a proud tradition of solidarity with countries like Tanzania. But we were also the 6thmost climate-polluting country per person among rich countries. With climate change the biggest threat to development in Africa, that contradiction rather undermined our solidarity. The recession means we’ve dropped to 12thin the aid league table, but we’re still the 6thmost polluting. Ireland has no excuse not to do our fair share to fight climate change. That means leaving fossil fuels in the ground and moving to renewable sources. 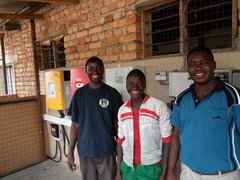 Solar energy can kick-start that transition by enabling communities turn schools, parish halls, sports clubs into community-owned power plants. Together, we can make 2017 Run on Sun. P.S. Every hour enough sunlight hits the Earth to satisfy global energy needs. 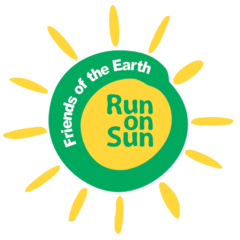 Please give what you can to help us make the future Run on Sun. 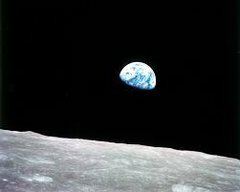 Photo: Earthrise by William Anders, NASA, taken from Apollo 8 on Christmas Eve, 1968. Wishing you a Happy Christmas and a peaceful New Year. Shop and Drop Supermarket Spree launches this weekend!